Love of travel and adventure has historically been an important characteristic of American cultural identity. In the 19th Century, these interests were manifested in a vogue for travel literature and artist renderings, especially paintings of exotic places, an interest that reached an unprecedented peak in the mid-century. Some artists traveled to the far North of the American continent, creating images of icebergs and frozen seas; others made their way to the far West, capturing nature's wonders there, while still others headed South to the Hispanic-speaking countries of Latin America. These artists from the United States, traveling throughout Central and South America, recorded in their paintings and drawings an extraordinary body of images of those regions. The height of artistic activity in the area took place between approximately 1830 and 1880, when draftsmen and painters, both famous and less known, set forth independently or in association with expeditions. Some were purposeful explorers inspired by the natural sciences, while others were simply wanderers, influenced by romantic ideas. For many of these artists, the experience was the turning point in their careers. Frederic Edwin Church's (1826-1900) painting, Heart of the Andes, (1859) is arguably the single most important and enduring of the Latin American landscapes created by a North American artist. However, the first noted artists to set sail for southern shores were Titian Peale (1799-1885) and Frederick Catherwood (1799-1854) in the late 1830s. Norton Bush (1834-1894), who became known as California's premier 'painter of the tropics', and Henry Ferguson (1842-1911), who had been inspired by Church's work, were among the last of the painters in the 1870s to return home from Latin American journeys. Often artists stayed for long periods of time, or made multiple trips. 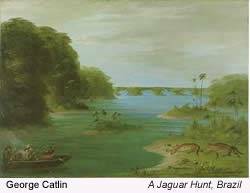 George Catlin (1796-1872), Jacob Ward (1809-1891) and Ferguson each spent up to five years traveling there. Church, Andrew Warren (d. 1873), Martin Heade (1819-1904), Catherwood and Bush all made multiple journeys. Because of its influence on the work of many prominent American artists, Latin America has had a significant affect on the art of this country. The unfamiliar terrain, such as the Andes and Amazon, challenged artists' basic perceptions of landscape painting and heightened their artistic powers. Some of the works they created are regarded as masterpieces of their age. Of particular note is the above-mentioned Church's Heart of the Andes, which was in many ways the touchstone of North American pictorial consciousness of Latin America. There is no doubt that Latin America made a significant contribution to the development of American landscape painting, and made the tropical world an acceptable subject for 'high art', as evidenced by the unprecedented high acclaim with which Heart of the Andes in particular was received in 1859. The western panoramas of Albert Bierstadt (1830-1902) and Thomas Moran (1837-1926) certainly followed the lead of Church's picture. It has been said that New York, artist Norton Bush was encouraged by Church to specialize in 'tropical' views, but it is likely that Bush's fascination with the tropics was fueled by his own journey in 1853 from New York to San Francisco, which took him across the jungles of Nicaragua. After he settled in San Francisco, his patrons were enthusiastic about the exoticism of his luminous works, such as Jungle Scene Sunset. After Church's tropical paintings began to win acclaim in the 1850s, Bush's works began to be praised as close California equivalents, and he became the most prolific and successful California painter of 'tropicals'. In search of subject matter, he made trips to Panama in 1868, and South America in 1875. Another California specialist in 'tropicals' was Fortunato Arriola (1827-1872), a Mexican painter who was working in San Francisco by 1858. 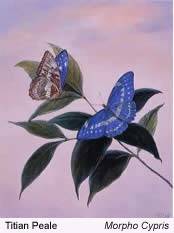 Arriola's works reflect the smooth surfaces and glowing atmosphere of luminism, and he composed pictures, at times fanciful, of tropical subjects, some of them from memory. In 1871, in hopes of gaining greater recognition, he traveled to New York where he successfully exhibited two Mexican scenes at the National Academy of Design. Tragically, in 1872, he drowned en route back to San Francisco. Others important works are Louis Mignot's (1831-1870) Lagoon of the Guayaquil; Heade's Passion Flowers and Hummingbirds; and James Whistler's (1834-1903) Nocturne in Blue and Gold: Valparaiso. Critics have repeatedly noted that for artists who painted in Latin American their visits gave rise to some of their finest and most original works, and was an experience that had permanent influence on their style. Motivations for mid 19th-century artists to travel South were varied. One reason was a basic curiosity about the southern parts of the Western hemisphere because for some Americans it was a time of a developing interest in Pan-Americanism, a sense of shared community with all peoples, North and South, of the American continent. It was a growing awareness of the uniqueness of the Western hemisphere, and some major painters had begun to think of 'Western landscape' not only in national but also hemispheric terms. In relation to Latin America, an increasing number of United States citizens were beginning to regard that region as a 'member of the family' and not foreign. Central and South America, according to the Monroe Doctrine, were considered geographical extensions of the United States, a sort of American 'spiritual property'. These attitudes, albeit proprietary, began to manifest themselves in politics, economics, science and art. Literature was influential in attracting travelers, including the writings of the German naturalist Alexander von Humboldt, author of Cosmos. His descriptions of his expedition of 1799-1804 stirred the world's interest in Latin America, and pointed out what a rich source of artistic inspiration it offered. Washington Irving's 'Life and Voyages of Christopher Columbus', published in 1828, referred to a quest to discover man's origins, and Henry Thoreau wrote of the discoveries of Raleigh, Cortes, Balboa and Pizarro. United States travelers filled with a spirit of exploration and inspired by literature, scientific curiosity and adventure took advantage of newly established steamship and railroad lines, and headed south into areas such as Ecuador, Peru, Chile, Brazil and Argentina. Henry Walke's (1809-1896) painting U.S.S. North Carolina Entering the Harbor at Rio de Janeiro (1848) recalls what sailing must have been like along the coasts. Some artists, such as George Catlin, Francis Drexel (1792-1863) and photographer Eadweard Muybridge, set out in forms of self-imposed exile to lands that seemed like an extension of the Old West. As it did for bank robber Butch Cassidy, who headed for Argentina, Latin America offered a place to hide and escape from difficulties, whether legal, financial, or personal, while still offering promises of exploration and discovery. In Catlin's case, he departed for South America after incurring significant debts, and unlike most of the adventuresome artists, focused on the native Indian people rather than the landscape. After living in Philadelphia and losing portrait commissions because of slanderous attacks, Austrian-born Francis Drexel went to Ecuador seeking to paint the portrait of Simon Bolivar, revolutionary leader. Although he missed the opportunity to paint him in person, Drexel did create a portrait based on earlier portraits of Bolivar, as well as ones of numerous private citizens and officials in Latin America. Photographer Muybridge’s circumstances were more scandalous, as he departed secretly for Central America to avoid arrest for murdering his wife's lover and allegedly poisoning his wife. Drexel's fellow Philadelphian, Titian Peale, stirred by Humboldt's accounts, made his first of several trips to South America in 1830, and was the earliest forerunner of the artist-naturalists who were to make numerous expeditions South. Peale's second trip was in 1838-39, as part of the Charles Wilkes (1798-1877) Expedition, which included draftsmen Alfred Agate (1812-1846) and Joseph Drayton (1795-1856). The same year marked the birth of American archeology, with the departure of Frederick Catherwood and John Lloyd Stephens, (1805-1852) who were to discover and illustrate long-lost cities of the Mayans. The Mexican War of the 1840s, along with the California Gold Rush, signaled an irreversible turn of interest towards Central and South America. The discovery of gold attracted countless travelers from the East, many of them journeying to the gold fields on ships via South America's Cape Horn or the Isthmus of Panama. 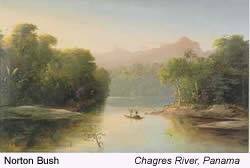 Charles Christian Nahl (1818-1878) was one of numerous artists who became familiar with the dangers of the Panama route, which he recorded in such paintings as Incident on the Chagres River. He painted additional scenes of life on the Isthmus of Panama onto the walls of a San Francisco restaurant and hostelry, The Railroad House, which were regarded by later artist and Latin-American traveler Charles Dorman Robinson (1847-1933) to be unexcelled for 'truth, color, or design'. Italian portrait artist Leonardo Barbieri (1810-1873) was perhaps one of the few artist travelers to arrive in Northern California for reasons other than gold. He made his way to San Francisco in 1849 after painting and teaching in Argentina and Bolivia, and then, after working for a time in various areas of California, eventually traveled back to Mexico and Peru. John Ross Browne (1821-1875) was one of the many North Americans who passed through South America in the pre-transcontinental railroad era when sailing around Cape Horn was quicker, easier and often safer than cross-country coach travel. Browne, who sailed Cape Horn several times, wrote and illustrated adventurous accounts including his popular Crusoe’s Island. New York landscape and genre painter Alburtus Del Orient Browere, (1814-1887), lured by the prospect of gold, traveled between East and West during the 1850s, first via Cape Horn, and later via the Isthmus. His landscapes, perhaps inspired by the views recently exhibited by Frederic Church, detail the tropical scenery he observed while making these travels. One of the lesser-known artists who did significant travel in Central America just before the Civil War was DeWitt Hitchcock (1832-1901). He traveled with Ephraim George Squier making landscape views of Nicaragua, San Salvador, Honduras and Panama. These scenes were subsequently lithographed for a publication, Squier’s Notes on Central America and were of special interest to United States capitalists who were planning shipping ventures and already thinking of a canal in Panama. In the 1860s, noted eastern artist Albert Bierstadt (1830-1902) journeyed overland to California, but returned to New York via the Isthmus. Although only a child of eight, James Everett Stuart (1852-1941) first traveled in 1860 with his family across Panama's Isthmus en route to settling on a ranch in Sacramento, California. Later as an adult, Stuart traveled extensively in the Northwest as well as returning southward to Mexico. Peter Baumgras (1827- 1903) of Washington D.C. exhibited Panamanian and Mexican subjects at the Art Association in 1872 and 1873, after visiting California via the Panamanian route. 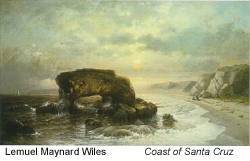 Heading to California to paint in the early 1870s, Lemuel M. Wiles (1826-1905) of New York also traveled through Panama and Central America, which resulted in his painting, Coast of Santa Cruz. Following the Civil War, yet another motivation for travel, artistic or otherwise, to Latin America occurred, when, beginning in 1865, Southerners considered emigrating and establishing settlements in Brazil. The famous naturalist Louis Agassiz, although not a southerner, was among those who benefited from the welcoming attitude Brazil extended to visitors and settlers following the War. In his case, he had steamship lines and the hospitality of the Brazilian emperor at his disposal. Swiss-born Agassiz was in the forefront of those opposing Darwin's theories in Origin of the Species. Taking a stand against the philosophy of evolution, he set forth to Brazil with his wife to explore such questions. Enlisted as a draftsman artist for the expedition was Jacques Burkhardt (1808-1867), creator of works such as 'Fishing Among the Rocks' (1865/1866, watercolor on paper). Brazil's Emperor Dom Pedro II personally visited the Philadelphia opening ceremonies for the 1876 Centennial Exposition there, a clear demonstration of the efforts of Latin American rulers to promote exchange between their countries and the U.S. In addition, the Exposition offered Americans the opportunity to view the works of Latin American artists, depicting their lands through their own eyes. Aside from the question of whether or not the United States and Latin America were to be considered 'related' in any way, whether spiritual, proprietary, or otherwise, what artists found there was strange, unfamiliar, and often difficult to assimilate into a concept of America. When an artist such as Albert Bierstadt traveled to the American West, he depicted an awe of nature's wonders mixed with a national pride, and for a time, a sense that the West 'belonged to him'. 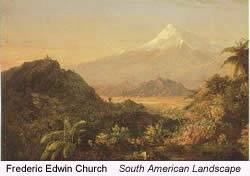 In contrast, it could be argued that Frederic Church's depictions of the Andes were a means of 'taking possession' of the scenery, bringing it to the attention of the stay-at-home public, and making it 'his'. The year 1859 marked a particularly significant year in the development of an expanded North American consciousness of Latin America: It was the year of the exhibition of his famous Heart of the Andes, as well as the appearance of The Origin of Species by Charles Darwin. It was only as people of the North learned more about those regions that preconceived notions would be altered, and age-old myths about what lay south of our borders lingered until late in the 19th Century. What artists created were primarily landscape images, although some, such as George Catlin depicted native Indians. In general, nature took precedence over living inhabitants or depictions of ruins of earlier civilizations. These 19th-century artists perceived Latin America in terms of vast, uncultivated, primeval space, as was also often the case in views painted then of the northern continent, where nature was emphasized over culture. Latin America was seen as a Garden of Eden, and references to Eden, Arcadia, paradise, Atlantis, etc were often applied to the views depicted. Somehow, in the wilds of South America, anything seemed possible, from Amazons to giants. Church is famous for his Andean panoramas. Mignot, who traveled with Church to Ecuador in 1857, is known for his lush and dreamy riverscapes, a subject no doubt familiar to him from his childhood growing up in South Carolina. Whistler is noted for his nocturnes, especially of the harbor at Valparaiso, in which he often incorporated elements of oriental design. As it had been since the time of Columbus' explorations for the East Indies, Latin America continued to be linked with the Orient, and Whistler's threading together of the two is symbolic of a recurrent theme in history, where Latin America as the meeting place of East and West. John Lloyd Stephens and Frederick Catherwood's depictions of ancient ruins sought the key to an understanding of the lost American past, as in Catherwood's 'Broken Idol at Copan'. San Francisco painter, Charles Dorman Robinson, who made trips in the 1860s and 70s also painted antiquities, as in his 'Ruins in Central America'. More than any other region, the 'tropics' seemed to hold the answers to many secrets of life. 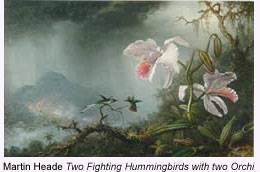 Heade is noted for his images of Brazil but even perhaps more so for his tropical flora and fauna, volcanoes, and especially hummingbirds. Christian Mayr's (1805-1851) Conquest of Peru demonstrates the persistent myths associated with people of the region and their supposedly endless treasures of gold. Also seeking answers to life's questions, John B. Fairbanks, (1855-1940) the progenitor of a dynasty of Utah artists, returning in 1892 after studies in Paris, spent time traveling in South America, following the footsteps of George Martin Ottinger's (1833-1917). Ottinger, who traveled to Latin America in the late 1800s, created images of Aztec life, such as 'The Last of the Aztecs', (1867, oil on canvas, Museum of Church History and Art, Salt Lake), as he believed pre-Hispanic life paralleled the Mormon experience. Fairbanks, in his own travels, sought proof of the stories contained in the book of Mormon. With the development of the Panama Canal project, realistic views of 'the tropics' evolved. In the 1870s, the precise location of the canal was being debated, but it was not until 1914 that it was completed, after vast costs, both in dollars and in human lives. Far from being simply the long-lost paradise pictured by some, the tropics began to be seen as also a dark and dangerous realm. John Mix Stanley (1814-1872) had traveled across the Isthmus in 1853, en route east after spending time in the northwest painting portraits, landscapes, and working in association with a Pacific Railroad survey. Martin Heade visited the region in 1866, and the following year exhibited his Lagoon in Nicaragua. Lake Nicaragua became an important theme also in Norton Bush's art during the 1870s, exemplified by Sunset over Lake Nicaragua. 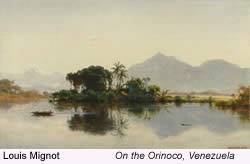 Other artists from the United States, including Andrew Warren painted many pictures of the Nicaraguan scenery around this time, a fact that reflects the public's demand for such images. In 1883, Church painted Twilight on the Isthmus of Panama. Many artists went South seeking to explore questions of the earth's origins. George Catlin, for example, was intrigued with the role volcanoes played in the earth's formation. Primarily a painter of the American West, and an expatriate living in London and Paris, he spent five years traveling extensively in South America. No other artist searched more urgently for answers to the questions of the origins of America's people. Many of his Latin American works were sketches, but an example of his oils is Ambush for Flamingoes (1857). Vignettes of penitent natives, wayside crosses, and mission churches were, however, often included as touches of 'local color', and served as elements of romanticism. Thatch-roofed village churches and gold-domed cathedrals became stock features in many panoramic landscapes. Colonial churches are recognizable by their domes and steeples, as in Andrew Warren's 'The Old Cathedral' of Panama. The frequency with which they are evident in Church's works, such as the dome visible in Mountains of Ecuador (1855), prompts the viewer to question whether they may have also served as a double function pun on that artist's own name, as he was known to sometimes sign his letters home with the picture of a church. Numerous 19th-century American artists headed for Latin America mid-century, to experience its balance of familiar and foreign, as well the 'otherness' that they sought. In addition to those mentioned above, other perhaps less-known artists who traveled to the region were: watercolorist William Benton Boggs (1809-1875); George Washington Carleton (1832-1901), an illustrator and cartoonist; painter Henry Collins Flagg (1811-1862); expedition artist Peter Bernard Wilhelm Heine (1827-1885); illustrator DeWitt Clinton Hitchcock; landscape painter and illustrator James McDonnough (1820-1903); Virginia born Julius O. Montalant (1823-1878); watercolor and oil painter Granville Perkins (1830-1895); expedition artist Edmond Reuel Smith (1829-1911); calendar artist Edwin Lamasure, Jr. (1866-1916) and Philadelphia artist Charles H. Spooner (1836-1901). Because of their varied experiences, this group of adventurous individuals redefined themselves as American artists by going South instead of West. They helped shape our visions of these little-known lands, as well as adding to a feeling of Americanism in a hemispheric sense. Through them, Latin America has made a significant contribution to the development of American landscape painting. Compiled and written by Teta Collins, April 2005. Updated 2012.